Can I ..? 1 printer connected to 2 computers 1 USB Y cable? It runs to the computer via USB. a USB Y or spliter cable? This way I don't have to disconnect the USB cable from 1 computer in order to print something from another. Re: Can I ..? 1 printer connected to 2 computers 1 USB Y cable? If your computers are connected to a network (they both connect to a router or a switch), you can share the printer over the network and print to it from either computer. The downside to this is that the computer the printer is attached to must be booted in order to be able to print. If you're on windows, i believe you can use the homegroup settings to share printers. I've seen it several times. There's a USB cable running for the printer to the hub. Which has multiple USB ports. Each port has an on off switch. From the port you run your USB cable to your computer. When you want to print from the computer. You click the switch on that hub. That way you can have four computers hooked up to one hub. And when you want to print from a specific computer you just turn on that individual Switch that goes to that computer. I mean, that would probably work, but like i said, if you're on windows, printer sharing is built in. you'd just keep it plugged in to the computer it's already connected to, and then share the printer with the computer it's not connected to. To my way of thinking, that switch is only slightly more convenient than unplugging the USB cable from the printer to the computer and plugging it into the other computer. which will allow you to make your existing printer accessible wirelessly. 1 linux ( not sure if going to be online or offline. Why 4 computers? Why not? The laptop is older and convenient PRN. The internet PC was my 1st build 3 years ago. ( way overkill for internet usage. But it was my 1st build so I went all out. Also at the time of the build my intention was to only have 1 computer. Now I have 4 ). The offline storage only is something I'm building now. Will only store files, pics and videos only. No need to be online. Plus keeping it offline make me feel more safe and secure. The linux PC was just for $%#$%@#% and giggles. I found an old HP in my basement and always wanted to try linux. To nervous to make the full conversion right now I decided to install linux on this to play around with. 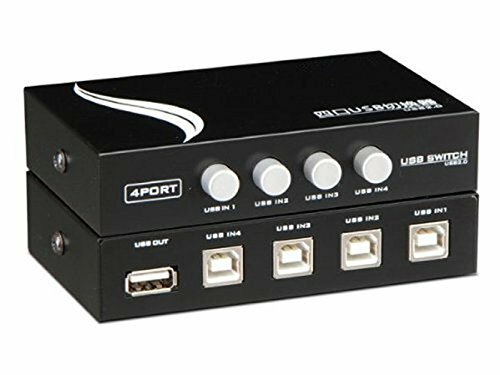 4 PC's connected to a USB sharing HUB to 1 printer needed? No. Don't wait to connect to network ( yes I see the practicalicty ). thanks everyone for your help and feedback? Lol, trying to get that linux pc to share the printer via homegroup would probably be a huge PITA. Frldyz, I have one of these 4 port badboys! Works like a charm for multiple devices.